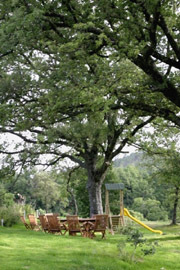 “Le Querce” Residence sets at the beginning of the village Sorano, in the province of Grosseto, situated in the High Tuscan Maremma, in the Città del Tufo’s archaeological park, just 9 km from Pitigliano. The sulphureous bath in Saturnia is about 30 minutes away from our Residence, the Bolsena Lake at about 26 away and both The Mount Amiata and the Argentario Coast are about 55 km away. More than 700 years ago, the “Supreme Poet,” Dante Alighieri described the thick forests and beautiful corners of the Tuscan Maremma. Amongst these ancient sites today is “Le Querce” Village, located in Sorano, a medieval town in the province of Grosseto. The Village “Le Querce” puts at the disposal of its guests, 24 apartments on 2 lined up villas with an independent entrance. The apartments are two-roomed and are composed of a living room with a sofa bed, a full optional kitchenette including a dishwasher, a bathroom with a shower and a double bedroom. All the apartments have a satellite TV, phone and internet socket and two air conditioners with heat pumps. An electronic key gives access to each apartment. The apartments were recently constructed according to the law and were elegantly refined and furnished. Those apartments on the ground floor have a private garden, while those on the first floor are equipped with a panoramic balcony. Inside our Village is a 20 x 8m pool, games and a special area for children, a tavern with a beautiful view of the parkland, a typical cellar entirely carved into tuff rock and a parking lot with 80 spaces. The Village has recently been furnished with a wellbeing centre and its proximity to the Saturnia Hot Springs and the Sorano Hot Springs makes it the ideal location for a relaxing vacation in the Tuscan Maremma. Take the motorway (Autostrada del Sole) A1 until Val di Chiana tollbooth. Then go towards Bettole-Torrita di Siena, at Gallina take the direction for Cassia towards Rome until Ponte a Rigo. Then turn to the left for the Provinciale 20 and in Sordino turn to the left for Sorano-Pitigliano then turn right for Castell’Azzara. In Siena take the Cassia towards Rome until Ponte a Rigo then turn to the right for the Provinciale 20 and in Sordino turn to the left for Sorano-Pitigliano then turn right for Castell’Azzara. -Motorway A1 (Autostrada del Sole) direction Orte-Viterbo, take the SS74 for the Cantoniera, from here continue towards Sorano, Castell’Azzara and Pitigliano.